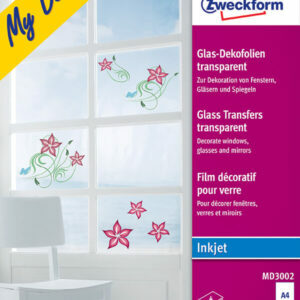 The transparent glass transfers MD3002 from AVERY ZWECKFORM in A4 format are perfect for designing creative stickers for windows, lanterns and mirrors. Design your own window sticker for Christmas or Easter, your kids will ove it! Simply choose a design or design your own one on your PC, print and stick to the window! The high quality will give you vibrant colours from both sides. 4 glass transfer sheet per pack. 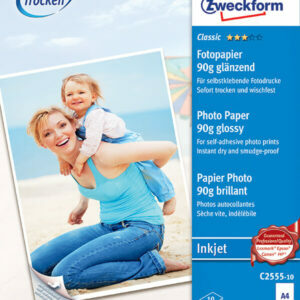 With the classic inkjet photo paper C2555-10 from AVERY ZWECKFORM in the format A4, you can print your snap shots or photos quickly and easily. 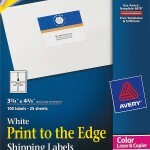 10 sheet photo paper per pack. The special photo coating will give you natural colours and impressive gloss. 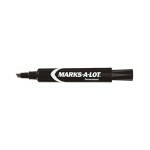 The printouts are instantly dry and smudge free with the effective drying formula. The self-adhesive 90g photo paper runs smoothly on all standard printers. 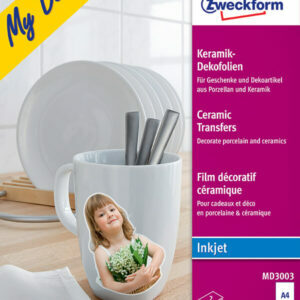 The transparent ceramic transfers MD3003 from AVERY ZWECKFORM in A4 format are perfect for creative designing fo cups, plates and all things made of ceramic or porcelain. Why not print a funny photo on a your morning cup or desing transfers for your dishes. The Avery Zweckform ceramic transfers are sutitable for white or coloured porcelain and ceramic. Simply choose a design or design your own one on your PC, print and stick to the surface. 2 ceramic fixation transfers and 2 transfers per pack. 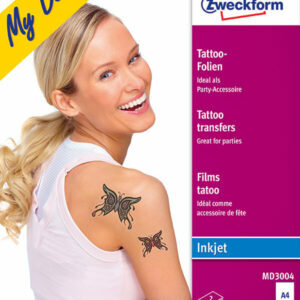 With the tattoo transfer MD3004 from AVERY ZWECKFORM in A4 format you can surprise your kids on their next birthday party! . Simply choose a design or design your own one on your PC, print, cut to size and stick to the skin. 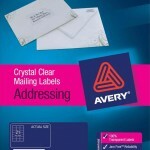 You can also find great designs at www.avery-zweckform.de/print. 2 tattoo transfers per pack. T-shirts are comfortable, easy to wear and can really show your team spirit. Make your next group event memorable with these Dark T-shirt Transfers. 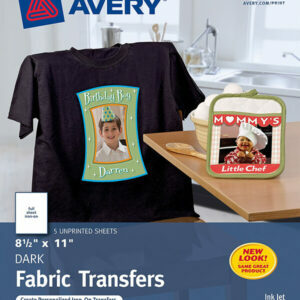 Get free templates and clip art images from avery.com to personalize T-shirts for any occasion or add your own digital photos. Transfers feed easily through most inkjet printers, and a special white layer prevents designs from getting lost on dark fabrics. Make one for everyone in the group and let your team pride show. Have you ever jotted down a phone number or address only to lose it later? 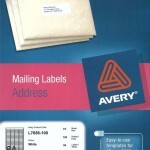 With these customizable Magnet Sheets, important contact information is sure to stick around. 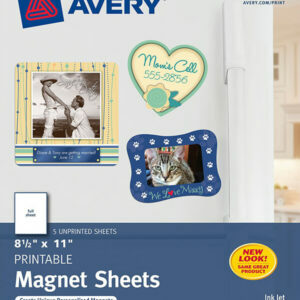 Create personalized magnets using free templates from avery.com or your own digital photos and then print them from your inkjet printer. Keep one big magnet on the fridge or cut several smaller designs into different shapes and sizes to give as gifts. There’s an idea that will actually stick. If crafting is your hobby, then these sheets of Printable Fabric are worth your time. 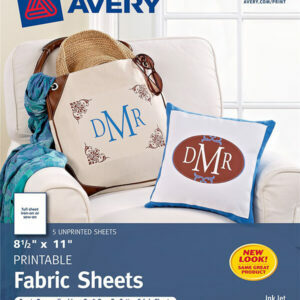 Dress up a tote bag, pillowcase or quilt with your own custom-made designs using free downloadable templates and clip art on avery.com. Then print creations from your inkjet printer for an impressive, store-bought look. Heat seal backings help printable cotton bond with other fabrics, cardboard and other porous surfaces with the help of a household iron. You can personalize projects to give as gifts to family and friends. Time sure flies when you’re having fun. Personalize stretchable sportswear, fashionwear and more with these Stretchable Fabric Transfers. 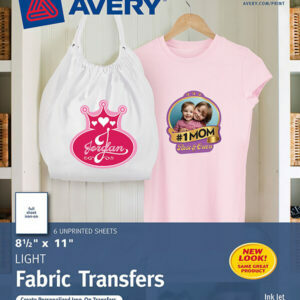 Get free templates from avery.com to customize projects with designs and clip art or use your digital photos to T-shirts, sweatshirts, bags and more for any occasion. 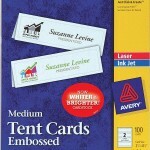 Unprinted iron-on transfer sheets feed easily through most inkjet printers. Personalize T-shirts with the name of your team or family crest emblazoned on the front with these T-shirt Transfers. 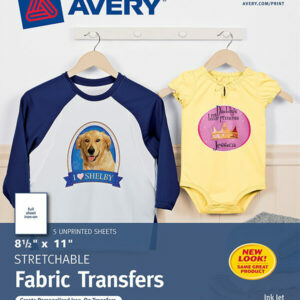 Get free templates from avery.com to customize T-shirts with designs and clip art or use your digital photos to make a T-shirt for any occasion. Unprinted iron-on transfer sheets feed easily through most inkjet printers, and a new Color Shield™ formula ensures crisp, long-lasting image quality. With special personal touches setting them apart, your group can wear their T-shirts with pride.